Publica's mission is to help you, self-publishing author, to make quality books! We believe that quality books require time and funding. Publica helps to ensure authors with the liquidity authors need to write and use professional services such as editing or proofreading. We help you set up a crowdfunding campaign, ignite your community of followers, grow it and let them support you! Traditional crowdfunding platforms cater mostly for paper books, blockchain made it possible to crowdfund ebooks. Your supporters will get an electronic access key that will unlock the book once it is eventually written! Be the first author to use blockchain for publishing - sign up for author updates! Publica mission is to make the commercial distribution of ebooks worldwide, no walled gardens and geo-fencing. We believe authors want their message to reach an entire world and decentralised blockchain brings this opportunity for the first time! If you are an author writing about crypto-markets, tokenisation and blockchain - let your readers really experience it in Publica app-reader combined with a wallet to hold a token that serves as an access key to your book. The First ever BOOK ICO run on Publica platform is successfully completed! All 1000 BOOK tokens are sold! The complete Publica platform's overview video is released by Cryptonauts channel! Watch the video here. Publica's e-reader app for iOS devices is released and is available to everyone on App Store! Publica released its web store, it is now possible to buy a book using the web interface. The American bestselling author Matthew Kepnes a.k.a. “Nomadic Matt” will be running the first Book ICO in history for his upcoming book “Backpacker’s Guide to Europe” starting 6th of May. Publica is listed on IDEX decentralized cryptocurrency exchange. PBL/ETH pairs are available. Trade here. We have updated Publica.com website! This improved version will give you more insights into what a "Book ICO" is and how it works! Meet Publica in London at the London Book Fair 2018 on April 10-12. See a full list of events Publica is participating in at the London Book Fair here. Watch the second episode form the “CEO answering authors questions” series with Josef Marc and Sukhi Jutla. Watch here. Kristin Over-Rein from BoldBooks explains in her article how Publica can add value to the book publishing process, and contribute to new business models for independent authors. A bestselling author, entrepreneur, and film director Michael Covel hosted Josef Marc on Trend Following Radio. Listed to the podcast. Publica is going to participate at the IBPA Publishing University in Austin, Texas on April 6-7. Publica released its new video explainer. Watch here. Publica has presented its E-reader App alpha! For the first time ever you can purchase books with the cryptocurrency (PBL)! Publica is going to participate in the London Book Fair 2018. Meet Publica in London on April 10-12! Publica is going to make a ruckus at San Francisco Writers Conference. Meet Publica on February 15-18 in San Francisco! Publica’s Ask-Me-Anything (AMA) session with developers will be held on Thursday, January 18, at 3 PM GMT / 10 AM EST. Books — Digital Locks versus Blockchain Tokens. Read Publica CEO's article. Publica Telegram group has reached 2,000+ members! Join our Telegram to chat with Publica founders and community members! Publica Giveaway competition Round 3 is running right now. Click here to participate! Publica announced Giveaway competition phase 1 winners. Follow our Twitter and Telegram, we have more giveaways! Publica Telegram group has reached 1,300+ members! Join our Telegram to chat with Publica founders and community members! Antons Sapriko, Publica COO is answering the question When will Publica platform be ready? My Ether Wallet added PBL to its token list - just click "Load tokens" and you will see your balance of PBLs there. When did blockchains affect books? Read another medium post from Josef Marc about the history of the first intersection between the books and blockchain. Follow the vision of Publica CEO on Medium - Are books over? and Amazon is the king, isn’t it? 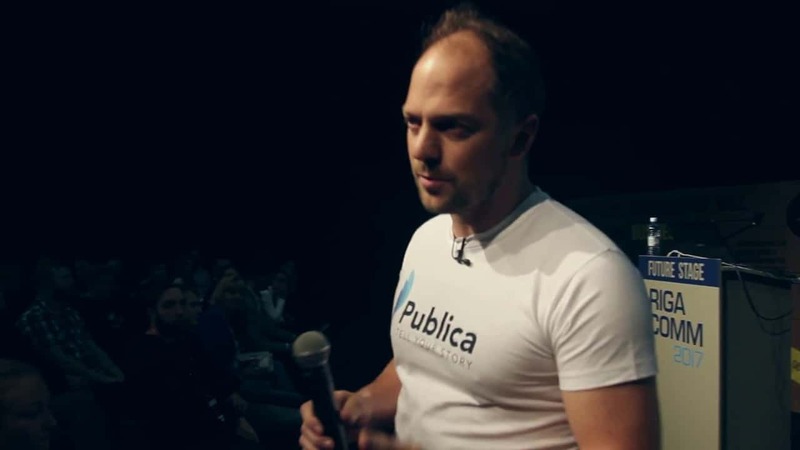 Publica CEO speaks at the FutureBooks London on December 1st - the place where CEOs of the largest players such as Kobo gather to discuss the future of publishing technology after busy book fairs of the year. 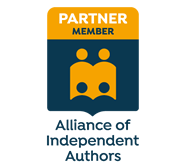 Publica celebrates being an accepted member on a Partner level to the Alliance of Independent Authors. Cheers to our Telegram community and its ADMINS, we just crossed 1,000 active members and counting! Cryptopia exchange announced listing of Publica’s PBL in their Twitter, PBL/BTC pair is available. Dev team started to work on Publica platform ahead of schedule, check proceedings of first session of tech discovery for Publica platform and protocol. WATCH VIDEO. 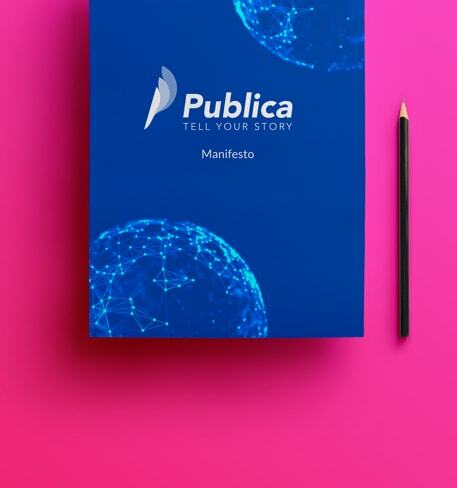 Design team started work on creating Publica page for AUTHORS, stay tuned for updates, when we publish it next week in our Telegram channel for community feedback. Circulating supply, total supply, prototype and other FAQ - click here for Medium post. Check Publica market cap, current price and markets at Coinmarketcap - Publica. Publica ticker is added to EtherDelta right after token distribution for all those, who missed the ICO and are eager to become Publica protocol token holder. Publica has distributed PBL tokens on WED 22nd of November 2017 at 10 PM GMT (5 PM EST, 2 PM PST). To set up in MEW, use 18 decimals, ticker - PBL and contrat address is - 0x55648de19836338549130b1af587f16bea46f66b. 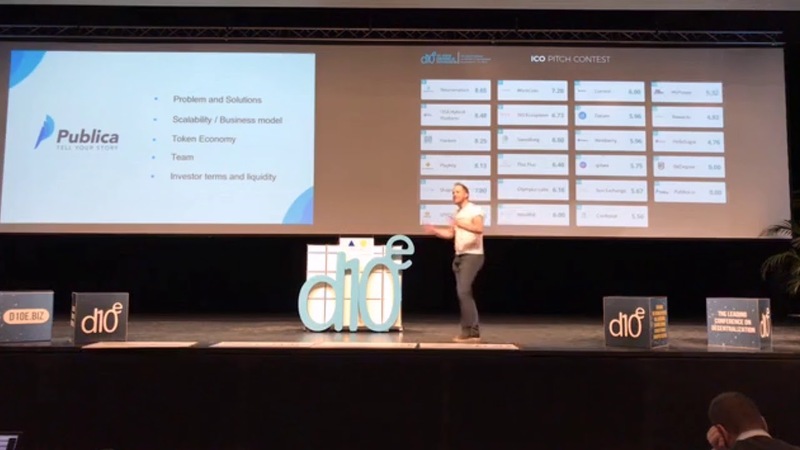 Publica is one of 25 ICOs selected to pitch at d10e - the leading conference in decentralisation held on November 11-14 in Switzerland, Davos. Transparent sales ledgers for sales of digital copies, audits not required. Elevates their current business model. Crowdfunding, online storefronts, scholastic and scientific institutions, patronage, serialization, collaborations, peer reviews, pay-as-you-read, public libraries, non-profits. Authors are creative, but now are bound by a controversial term “license” and EULA. Protocol introduces access key and frees authors from legal constraints into discovering new business models. Freedom to market, publicize, and sell to the whole world, without fear of chargebacks, errors, or cheating. Sell on proprietary online storefronts too. Strong resistance to censorship and tampering by the immutability virtue of blockchain-based storage. Finished works are automatically dated and fixed, no matter how many editions or variations are sold. Direct control over what to publish, at what price, in an ever-more-decentralized world of global ecommerce. Long-lived ebooks, never abandoned by a publisher's fortunes or licensing model. The Publica protocol continues working even if Publica-the-organization goes away. Lower prices. Payments go directly to the author’s wallet with no intermediaries required. Irrevocable ownership. Your ownership of READ token linking you to decentralised storage is immutable. The protocol supports paper books print-on-demand. Secondary markets and persistence. Sell or give book keys as you wish. Ebooks on decentralized storage don't disappear. "Radical inclusion." Authors can include their readers in crowdfunding and other business models that provide the capital necessary to produce great book projects. Lower-priced paper books. Print-on-demand where the reader is, no shipping. Eliminate waste in traditional large print runs and warehousing. Own a piece of the protocol. The Publica protocol requires Pebbles (PBL tokens) in a fixed supply. Pebbles are the sole medium of exchange in the Publica workflow. Be an important part of tokenizing access and decentralising storage of the world's information that's suitable for ecommerce. Wallet-to-wallet, starting with how big ideas and deep knowledge are shared - in books. Independence. The Publica protocol is open source, decentralised and immutable. Smart contracts, once set on a blockchain, work without third-party mediation. Democratizing value and trust. Book buyers vote only with their own wallets. A radical inclusion of buyers and sellers, with their incentives aligned, mediated only by blockchains. Spreading books to the under-booked, and the under-banked, around the globe. Publica's ICO is the luckiest of them all because it gets to put cryptocurrency wallets on all kinds of devices. I love the idea. I think it could be used as a tool to democratise access to information and education. I would love to hear about any plans or ideas to take and enable this idea in the developing world. For example, I would be more than happy to pay/give/donate my READ tokens to someone in the developing world (or even someone in need in a developed nation) who could really use/benefit from the content of that ebook. I would caution against necessarily entering the academic publishing space. As a researcher in my past life, I place great importance on the veracity of the peer-review process for academic publications. I think that allowing anyone to publish an article that could be seen by an untrained eye to hold the same level of scientific understanding and validity as a peer reviewed journal article could potentially be dangerous. That being said, I think journals themselves are probably ripe for disruption as a business model. I would be interested to see any feedback from other academics on your proposed idea. This sounds like a cool idea. One thing that's unclear to me is how storage will be integrated. (I don't see any Swarm or IPFS integration for example). Where will the literature be hosted and are you building the hosting platform in addition to the access control? If so how will the access control interface with document storage? Once integrated will there be any checks to ensure the expected data hasn't been tampered with (i.e. something like https://provt.xyz)? I would upvote and like the idea. I see the verifiability of data as a key to building trust in the future. I’m not sure if this is a tech problem though or a buy in from enterprise problem to get the data. I lean toward the latter and sales cycles / integration is slow. Think about whether this really needs a token. I’m interested to learn more about why you think auditing Amazon’s practices is a burning issue. I am involved in blockchain and mediatech myself (our company provides content protection technology to media owners – including the ebook industry). Blockchain and media is a fascinating area, and there are many old, established industry silos ripe for disruption. Publishers don't make use of closed, proprietary platforms like Amazon because they have no alternative. Instead, they when they choose to use these platforms it's to increase discoverability. That being said, this industry is so large, with so many interesting niches, there may well be a very valuable use case for your technology. I really hope you can make it work, and please feel free to reach out if you'd like to discuss this further. I like this idea, however being bound to the ETH blockchain is putting alot of eggs in one basket in my opinion, I would suggest looking into agnostic chain technology such as Blockstack. I bookmarked publica.io though for future reference. You will need to build an application (Layer) on top of Ethereum similar to a lot of current projects. You need to remember that Ethereum Blockchain is ultimately where your storing this data and retrieving it from and the Ethereum Blockchain is fueled by Ether not your ERC20 Token. Your layer is going to need Ether to function. A shapeshift type mechanism can be built in place or you can have an already existing Liquid Market set up on EtherX in order to perform the function in real time so that your Token has utility. Even by becoming a de-facto largest publisher, Publica will have zero inventory, while published books will last forever both for its readers and the World. Publica's operational protocol layer is built in Solidity and uses Ethereum network computing power. It enables decentralisation of direct transactions in protocol currency between readers and authors in order to purchase access keys for the literary works of the later. Forget about EULA and License! Meet ERC20 as an Access Key. Access keys purchased for protocol currency are represented by ERC20 token, we call it READ token, which is unique for each literary work. Purchased READ token balance is mapped versus the public key of its owner in Solidity. Equal and free access to the Ethereum blockchain underlying data enables transparent verification of the ownership and authorization of access to a literary work that this READ token is associated with. Literary works will be stored in decentralised immutable storage built on top of continuously advancing solutions for decentralised immutable storage. Publica protocol is experimenting with connecting to solutions offered by IPFS, Storj, Sia, MaidSafe and upcoming Filecoin, EOS and eventually Swarm for Ethereum. Publica protocol is powered by its currency called Pebbles (PBL, ERC20 token) that has fixed and locked supply. Protocol app layer of customer-facing apps will be built by the protocol team as a white label, open source tools available to the community for branding, extending and embedding into other applications e.g. enhancing current ink-readers and e-readers with a wallet-module supporting Publica protocol. With READ Tokens, RIGHTS Tokens, and smart contracts, they all can win. Authors aren't paid when paper books are resold. Readers and online storefronts can't trade ebook licenses in secondary markets. With READ Tokens, RIGHTS Tokens, and smart contracts, they all can win. Their new business models can evolve on the Publica protocol. Interested? Read all about it! Josef Marc leads the Publica team. 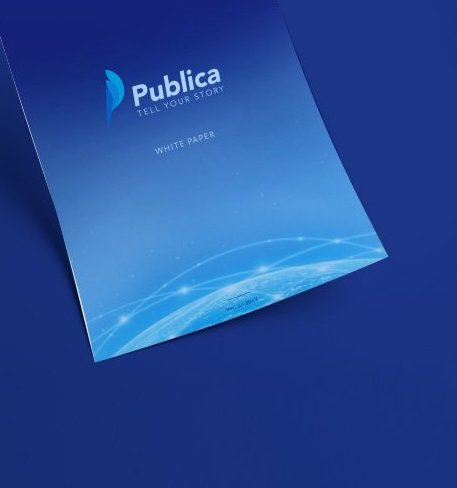 Although he didn’t originate the Publica idea in its earliest form, he volunteered to write the white paper that thought it through to its logical ends, and decided to help bring it to fruition. His experience leading teams in the launch of DirecTV, 500 channels of fully-automated digital satellite television, and the launch of Verizon FIOS TV, national cable television on a telephone system backbone, prepared him for Publica because we too are launching something that hasn’t been done before. Also part technology, part operations, marshalling hundreds of people in multimillion-dollar budgets, in the public eye. He’s helped startup companies to reach healthy success before. He co-founded Archimedia Technology, acquired by GrayMeta. At Front Porch Digital, acquired by Oracle, he designed systems and operations that preserved and made digitally accessible the ten-year videotaped history of the United Nations Criminal Tribunal for Rwanda. 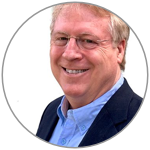 At SAMMA Systems he worked closely with the United States Library of Congress NAVCC technical and operations teams. His first technology job was in a startup that was acquired by Sony to form its broadcast systems integration company in what the media calls an aquihire today. At Sony he managed teams building two Olympics broadcast centers for CBS, several Jumbotron control rooms including New York Times Square, and innovative entertainment and interactive television systems for Celebrity Cruises “cyberships.” We can take systems like those for granted today but somebody had to do them the first time. He’s comfortable with technology on the leading edge, learning it and explaining it so others can understand it from their own perspectives. As a longtime member of the Society for Motion Picture and Television Engineers (SMPTE) he authored four technical papers, presented them to critical audiences at SMPTE’s annual conventions, and contributed steadily to standards committees. Josef’s first career was in music and that’s when he first learned how publishing and self-publishing work. He and a partner wrote, recorded, printed, sold and shipped their own music on vinyl records until the manager of The Police, a superstar group, signed them to a publishing deal for his company. He’s a constant reader, always interested in the economics of publishing. He studied in the pre-law curriculum at the University of San Diego. A pioneer in Bitcoin trading technology and systems, Yuri Pimenov knows the blockchain revolution extremely well. His experience as the head of research & development for Latvia’s top brand and most popular website besides Google led him through the technical challenges in machine learning, robotics, and high-load Internet technologies. Yuri is one of the few industry professionals who can be counted on to connect a grand vision with a real-life technical solution. Yuri is a longtime contributor to the blockchain community with his blog and his Russian translation of the seminal book "Mastering Blockchain" by Andreas Antonopoulos. Before Publica, he was the CTO of a leading Bitcoin exchange. Other work experience includes peer-to-peer lending platform development, a national email server, automated magazine publishing, and Internet radio. Yuri earned his Master’s Degree at Riga Technical University. The blockchain revolution and its demand for experienced high-quality services is sure to grow exponentially and that’s where Antons Sapriko comes in. Antons grew a company of two people to a hundred times that size and an industry leader serving the very top retail companies. He brings highly adaptive and growth-oriented business management strategies into Publica’s fold. Antons is responsible for operational management in Publica. His experience leading Scandiweb from a local agency to becoming the largest ecommerce services provider on the Magento platform will help Publica take care of business. He will bootstrap Publica’s roles for marketing, HR, development, quality assurance, creative infrastructure, and technology services for all Internet-connected platforms. Publica benefits from Antons’ experience in setting up workflows for enterprise-grade delivery to Walmart, Jaguar, Land Rover, The New York Times, Peugeot and many other brands and startups since 2003. Antons started his contribution to the blockchain revolution in 2014 leading a series of workshops explaining to the Scandiweb team how the Bitcoin blockchain works. Blockchain-related workshops and practice sessions led to go-live projects and they continue to this day. As of this writing, in July 2017 he and his teams built and launched successful smart contracts and blockchain apps for the launch of large-scale Initial Coin Offerings (ICOs) for $25 and $30 millions led by USA-based Element Group. Antons comes from a technology background. His father made the first-ever dial-up connection in his country in 1986. Antons learned to code at 14 and won top places in Math Olympiads on the national level. He earned a Bachelor degree in Business Administration at Stockholm School of Economics in Riga, a top-20 business school and started Master of Science at the IT University of Copenhagen. “Blockchain will go down in history as one of the most disruptive technologies of all time, Publica’s vision to unite it with printing and the internet, two of humanity’s most disruptive inventions, is brilliant and perfectly timed for this revolution in human history. The Publica platform is going to enable a lot of positive change for many people around the world. Marc Kenigsberg is the founder of Bitcoinchaser.com, one of the most popular resource sites for blockchain enthusiasts, and a regular speaker and contributor at industry events around the world. With 18 years’ experience in online marketing and having advised many successful blockchain businesses, Kenigsberg is a strong addition to the Publica team. Blockchains create opportunities for orchestrating multi-sided markets where publishers' tasks are partly automated and partly taken over by the gig economy. “Today's publishing houses are built on the foundations of Gutenberg's ancient invention. With the actual printing process at the center of the value chains, publishers have created an industry where they control most of the elements, from draft of the manuscript to the book being sold. In this system, the ones who do the greatest job, the authors, are left with the smallest piece of the pie, something which may be changed by new technology. Professor of Technology, Communication, Organization and Management at the Department of Sociology and Political Science at NTNU Norway. Sought-after keynote speaker, government advisor, and author of several books on social economics and digital marketing. Also reads books. “Publishing is changing, but still broken. Authors are scrambling to understand and figure out what they should do now to be successful. They could use a platform that brings together a network of designers, editors, distributors, and marketers, which offers all parts of the publishing process-safely without scammers. This community must also be a place where readers can discover their books, buy them, exchange them, and become fans. It needs to be a community, where authors can get questions answered, make profitable transactions, and develop connections that satisfy their own individual goals, however great or small. Author of ten science fiction novels. As a self-taught self-publisher and CEO of Digital Imagination Publishing, Sheron studies the effects of disintermediation in traditional publishing. Working on her next novel. Artists with vision have a new form of security when tying other artisans into their book. “The attraction of Publica is how it reduces the risks of uncertainty in task completion, compensation and capital investment. In the 21st century, sub-contracting on the blockchain ties participants to a vision, indifferent to the awkward timing of payments too little, too soon, or too late. Free agents bring their special expertise to work and they're compensated in a hierarchical member-funded model. The open ledger of smart contracts is their blueprint and progress report. With the sophistication of division of labor, we can divide time and funding. The backbone of productivity has two stronger legs to stand on. Economist, financial technology consultant, adjunct scholar to The Mises Institute, Degrees in both Economics and Statistics from San Francisco State University, and Phi Beta Kappa. 30 years’ experience delivering Business Intelligence development to executive management of leading US financial institutions. Worked for Federal Home Loan Bank of San Francisco, Wells Fargo Bank, Visa, and Bank of America. Scandiweb has helped us greatly to understand an implement our ecommerce platform on Magento. They have repeatedly gone above and beyond in assisting us with design and process decisions and have quickly implemented our workflows, several of which are likely new to the Magento platform. I would not hesitate to recommend their services to other organizations seeking to implement an ecommerce solution quickly and correctly. Working with Scandiweb has been a positive experience, they have consistently kept their timelines and have competent people with the technical expertise to finish the job. Experienced and responsive. A true partner whose expertise we rely on for our toughest projects. We have been increasingly impressed with Scandiweb since we began working with them on our website. They have been very attentive to our project and respond quickly to any concerns or requests we make. Most importantly, in a world of programmers learning as they go, the work Scandiweb has completed for us has been high quality and professional. We don’t hesitate to throw difficult tasks their way and they rise to the occasion each time. Overall, Scandiweb has been a great find for us and the key reason our website is of the quality it is today. We wouldn’t hesitate to recommend them to anyone. Working with Scandiweb is a pleasure, their dedicated team makes working in an Agile way really quick, lean and simple. They think, discuss, and most importantly do what was discussed. We ended up not quite getting all our wanted features in the first release, but the features that were released worked as agreed. More than happy to recommend them! We are DARTZ - World's Most insane coachbuilders. Scandiweb did the impossible - somehow they always understood my insane ideas, which I never explain properly. They are building a website which for sure will be the most unique automotive industry site on the planet. A trait it will share with our cars and other opulent products. Certified Scrum Master and Product Owner, experience in delivery for the New York Times, Walmart, JYSK. Financial Advisory. CFO at Scandiweb Andrew joined Publica to bring accounts transparency for the community, he has been working as a Senor Auditor in KPMG and internal auditor at Kronospan. Tokens were minted till the hard cap was reached. Token supply is locked. Circulating Supply - 18,582,933 PBL; Total Supply - 33,787,150 PBL. What is Publica's protocol PBL token? PBL token is the currency of the protocol. For anybody to use affordances provided by it, one has to purchase and pay with PBL for that. For example, to buy access key to a literary work one has to pay in PBL for it as all prices for objects created and traded within the protocol are denominated in PBL. Supply of PBLs is fixed and locked. PBL is ERC20 token that can be sent to compatible wallets and managed from them. Publica is "a publisher for the blockchain era"
Radio, TV, Books are mainstream. Crypto is fringe? A Billion Stores, A Common Linkage? Blockchains create opportunities for multi-sided markets. Publica — Why We’re Doing It. Why call things by their right name? Or, Publica brings back Representative Money. Publica is designed to be purely informational. We notify users of the website about the concept and status of Publica’s Initial Coin Offering (ICO) of PBL’s and other cryptocurrency market information for analysis purposes only. Every effort is made to keep the website up and running smoothly. However, Publica takes no responsibility for, and will not be liable for, the website being temporarily unavailable due to technical issues beyond our control. The information provided here should not be interpreted as advice or encouragement for investments of any kind. We do not guarantee the success, legitimacy or value of our project. 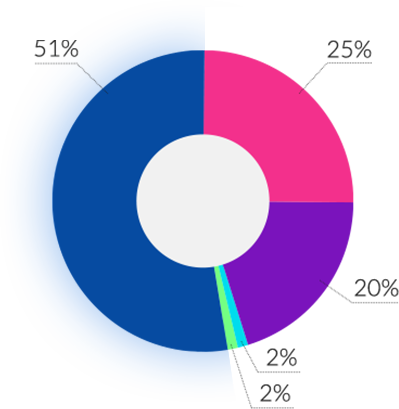 Users are responsible for investigating and researching each themselves before deciding to support and contribute to Publica. The disclaimer information contained in this website is for general information purposes only, and we endeavour to keep the information up to date and correct, we make no representations or warranties of any kind, express or implied, about the completeness, accuracy, reliability, suitability or availability with respect to the website or the information, products, services, or related graphics contained on the website for any purpose. Any reliance you place on such information is therefore strictly at your own risk. There are significant risks associated with contributing to an ICO’s, including Publica, that may include loss of all your funds and also any additional commissions and other expenses, and you hereby accept and declare that you are willing to undertake this risk and in no event will we be liable for any loss or damage including without limitation, indirect or consequential loss or damage, or any loss or damage whatsoever arising from loss of data or profits arising out of, or in connection with, the use of this website.